Transatlantic is a neo-prog "super-group" gathered together by Dream Theater's drummer Mike Portnoy. Mike really knew what guys must be in a neo-prog "super-group": there are Neal Morse (keyboardist and vocalist of Spock's Bread), Roine Stolt (guitarist and vocalist of my favourite neo-prog band The Flower Kings)and Pete Trewavas - bass player of good old Marillion. At the moment when I'm writing this review (March of 2002) they have already released two studio albums and one live album. The first album called SMPTe was released in 2000 and has only five tracks on it. The centerpiece of the album is certainly 31-minute 6-part suite called "All Of The Above". This song is maybe my favourite neo-prog epic, full of great professional jamming, solid melodies, good pop vocal parts and almost Dream Theater-like heavy parts. 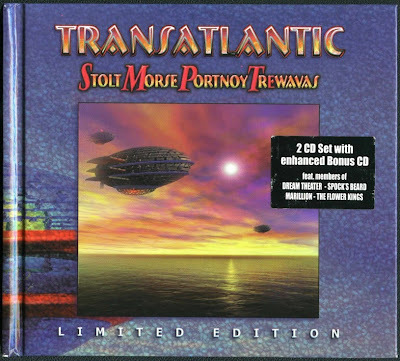 Stolt's epic ("My New World") is only a little bit weaker (due to those cheesy vocal parts) and cover of Procol Harum's "In Held Twas In I" is a boring, but tasteful showcase for these guys' playing talents. Two shorter songs (Morse's "We All Need Some Light" and "Mystery Train") are just good AOR and nothing else. The double live album called Live In America was released the year later and features some classy Beatles ("Strawberry Fields Forever" with a huge jamming part in the middle and short parts of "Magical Mystery Tour" and "She's So Heavy") and Genesis (the instrumental part of "Watcher Of The Skies" and the whole "Firth Of Fifth" gathered in one medley). Plus,there are all songs from SMPTe perfomed as well (with the exception of "In Held...", but that's no tragedy - believe me). The ending mini-suite of the album consists of The Flower Kings' "There Is More To This World", Spock's Beard's "Go The Way You Go", Marillion's "The Great Escape", Dream Theater's "Finally Free" and the above mentioned Beatles' "She's So Heavy". Also released in 2001, the second studio album called Bridge Across Forever has even four songs now! Great "All Of The Above"-like epics "Duel With The Devil" and "Stranger In Your Soul" shows the same direction of "All Of The Above". Some kind of Beatles tribute called "Suite Charlotte Pike" is a 14-minute suite in a way of The Beatles famous Abbey Road suite. For me,it is the best song on the album and maybe in all Transatlantic small entire career. The title track is weak and strange, very boring pop ballad that could ideally fit on Beard's Day For Night. All tracks by: Morse & Transatlantic, except: 4 - by Stolt & Transatlantic, and 5 - by PROCOL HARUM; rearranged by Transatlantic.